Solar energy battery storage from Fronius Symo Hybrid. Unused energy from your solar pv system can be stored in a battery with our recommended Fronius Symo Hybrid system. It is Fronius’ vision to supply “24 hour sun”. One of the ways to achieve this is through solar energy battery storage; helping your business to have self-sufficiency through maximum energy independence. Unused and excess energy provided by your solar panel system can be stored in the battery system. It can then be used at night-time or when other conditions make it impossible to generate solar power. The Fronius Symo Hybrid system also has an emergency power function. If there is a power cut you will be able to rest assured that your premises will still be receiving energy from your solar energy battery storage. Emergency power function and battery can be retrofitted. Range of different storage capacities available (4.5 – 12.0 kWh) . Retrofit to existing solar pv arrays. DC-coupled system. Providing higher efficiencies than AC systems as there are no multiple conversions between AC and DC. This allows for the maximisation of self-consumption from the energy generated from your solar energy system. All the energy you produce can be used in your business premises, no matter what time of day or night. No need to buy electricity from your energy supplier at ever increasing prices. (Ofgem predict a 5% rise year on year, at a minimum). Three phase emergency power supply. Making sure that your critical appliances are kept on during power outages. 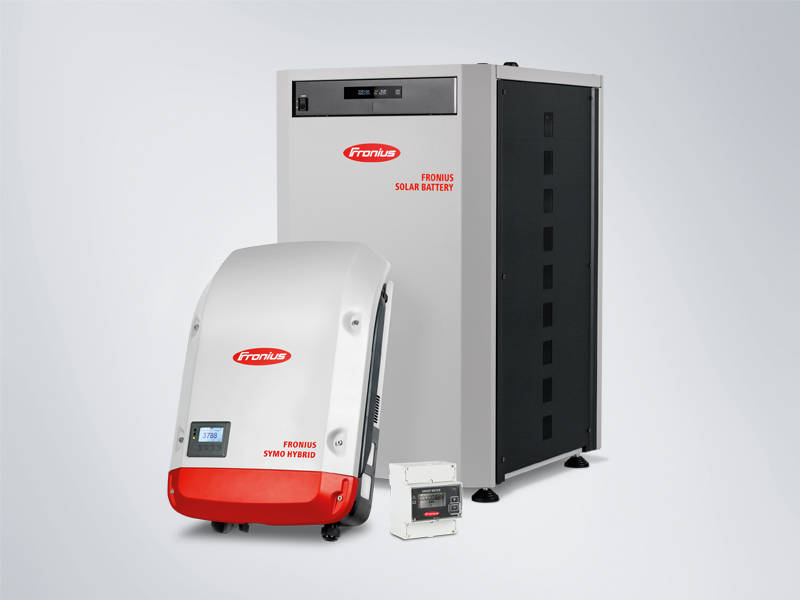 The Fronius solar energy battery storage is supplied with a built in web server with graphic interface. This enables a straight forward configuration of the system to suit your requirements. It also provides a user-friendly interface for a clear view of your business’ power consumption. The Fronius Smart Meter is a meter which both optimises self-consumption, and records your premises load curve. In conjunction with the Fronius Solar online portal, the Fronius Smart Meter provides a clear overview of a user’s own power consumption. The solar energy battery storage from Fronius is a perfect example of high-performance lithium technology. A long service life, short charging times and high depth of discharge are therefore guaranteed. The storage capacity of the Fronius Solar Battery can be adapted to meet individual customer needs. See Fronius for more details on energy systems available.